The most cautious boaters can sometimes experience unexpected problems on the water. That's why the U.S. Coast Guard recommends that all recreational boaters, including personal watercraft and paddle sport users, take advantage of the free Vessel Safety Check program every year. The Vessel Safety Check (VSC) is performed at your boat – whether in a slip, at the launch ramp, or in your driveway – by a certified Vessel Examiner, at a mutually-convenient time, and usually takes 30 to 45 minutes, depending upon the size of your boat. If your boat does not pass, no report is filed. Instead, you are provided a written report that aids you in correcting any discrepancies noted. Often, a quick trip to the local marine chandlery is all that is necessary to obtain missing safety items and easily pass a re-inspection. The Coast Guard Auxiliary maintains a complete Web site at www.vesselsafetycheck.org that will tell you what you need. While there, you may take a Virtual Vessel Safety Check, find an examiner near your boat, and learn why boats fail. And if you'd really like a comprehensive understanding of the Vessel Safety Check, and how it relates to your boat, you are welcome to download the 52-page Vessel Safety Check Manual that is our examiners' "bible". But don't delay! Schedule your free vessel safety check as early in the year as you can, and set an example as a safe recreational boater. 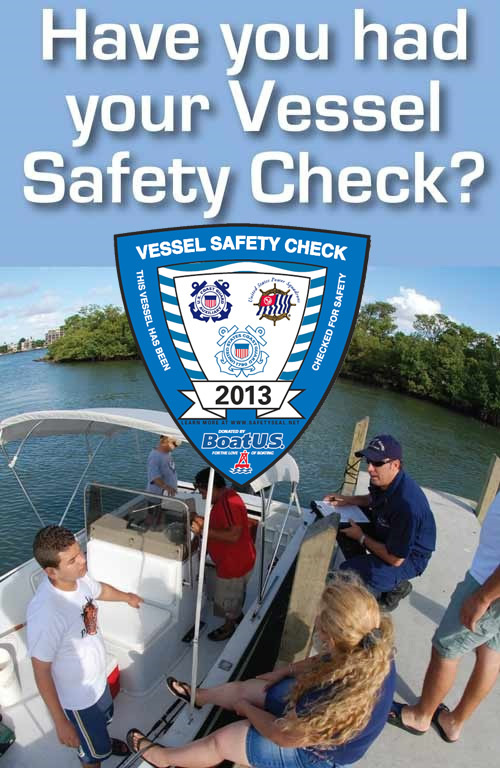 Remember, visit www.vesselsafetycheck.org or call 1-877-875-6296. And remember, no vessel is too large or too small to be safe – and in compliance. Your family, friends, and fellow boaters will thank you!